EASY TO USE SOFTWARE TO STREAMLINE YOUR HR MANAGEMENT. 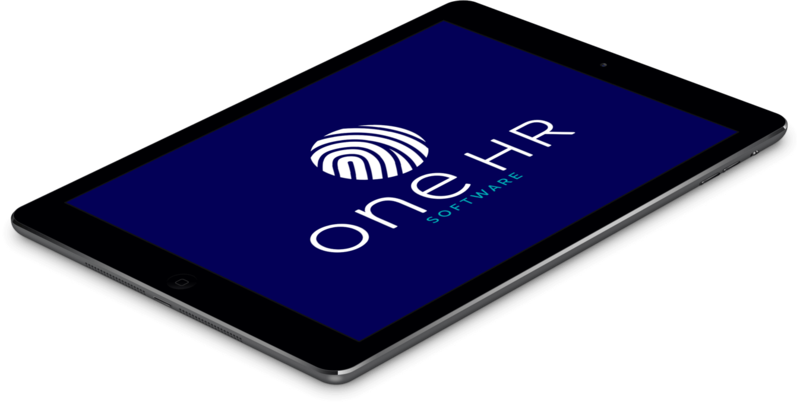 oneHR is a HR software which streamlines and simplifies human resource management in order to transform this centralised business function. oneHR software makes HR admin tasks less of a headache, resulting in a HR function that is more efficient. It provides businesses with real-time data insights, to make informed and better decisions when managing people. The software has been designed to intelligently and intuitively resolve HR issues. one HR will help to track, monitor and engage with employees, whilst providing managers with a centralised view of employee data. It helps to empower employees with its self-service tools which creates a great user experience. A centralised location for HR records with different levels of user access. Each user has access to view and control information appropriate to their level. Employees can log into their own records at any time. Employees can submit holiday request and Managers can approve them anywhere and at any time with our IOS and Android app. Our software is used by a number of different industries due to its flexibility. It can be tailored to fit your business' needs so that all your fields and settings cater to the business and industry needs. 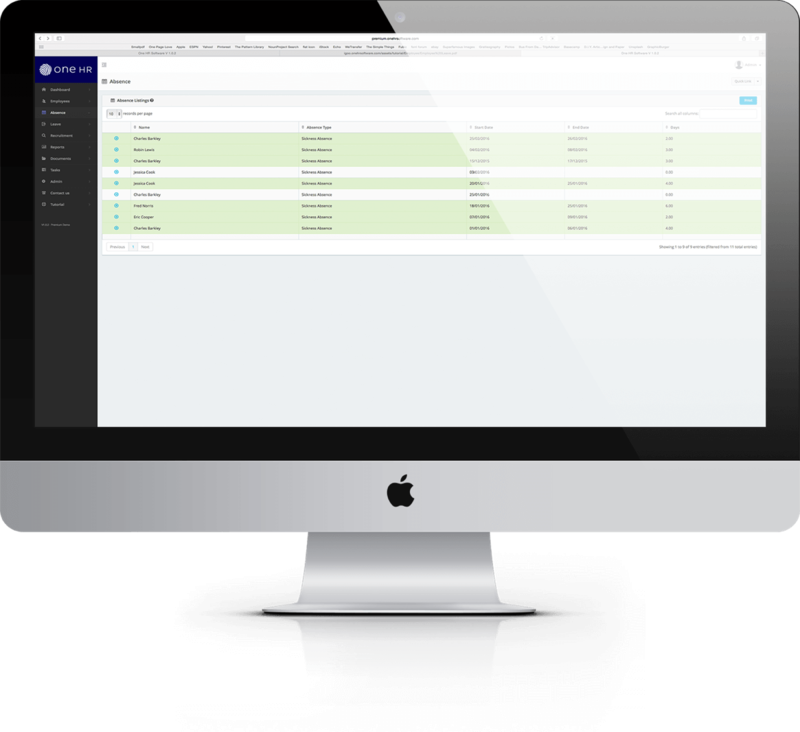 oneHR is a cloud hosting platform which protects your data; everything is encrypted, and sent using HTTPS. oneHR has an archive system and encrypted remote backup. Managing multiple calendars can be stressful with potential for clashes and fear of being understaffed, especially at busy times of the year. You can avoid this by managing holiday requests through oneHR’s holiday calendar, which gives you a complete overview of your organisations and/or teams holiday planner. You will have an organised view of who is in at a click of a button, you can approve or reject holiday requests without even being in the office. This eliminates the time that is wasted when filling in paper holiday requests and waiting for approval, then filing them against employee records. The self-service HR solution gives employees a view of their holiday allowance and teams calendar to avoid clashes when requesting holidays. It is easy to use, saving hours of admin time, excess fuss, and most importantly less paper, which helps to create a paperless office. Storing company information, such as policies and procedures in one place can prove difficult to manage. oneHR has an unlimited amount of storage, so you can store as many documents as you like onto the oneHR system and can be accessed by employees as and when they need them. Contracts, policies and procedures can be kept up to date and legally compliant by your HR, then uploaded onto the software. For those companies without a HR function, you can get access to oneHR Expert employment law specialists, who can help protect you and your people. The cloud-based storage for documentation means whether your business increases or downsizes you can easily access more or less storage from a safe, remote server. This feature is agile and resourceful. Tracking employee behaviour can help towards measuring the impact and contribution of employees to the business. Recording absence and lateness helps you to identify patterns and trends, so you can improve the stats if they are showing poor performance in this area. Managers can input absence and lateness for their assigned team into oneHR. It assists businesses to have a proactive approach to absence management. Employees who are consistently missing or arriving late to work are seen, but also employees who are more diligent are also acknowledged in a positive light. Enabling impartiality and transparency within your organisation. Data analytics is becoming an important part of the HR function and pulling together information to analyse from various sources can be time consuming and could be inaccurate. One of the key benefits of having all your HR data in one place to interrogate, is the ability to track employee behaviour and identify patters, to improve the business’s operational output. oneHR has a comprehensive reporting function that analyses employee information and identifies any patterns in absence or areas of concern. oneHR allows you to filter, group and sort all your data in the system and reports can then be generated by employee, team or department level and presented in various formats to best suit your business. You can export data from your oneHR system records in formats such as; Excel, PDF, and CSV. It provides you with distinguishable data and saving you time. Performance management reviews can present an admin burden on managers and the HR function of a business. As a HR team and/or Manager, employee appraisals and performance reviews need to be carried out correctly, so the entire process is run effectively and timely. With oneHR, objectives are achieved and performance improves by managing your appraisal process, oneHR reminders and task management features enable you to see employees’ progress and performance. The notifications ensure you remember to conduct appraisals, and managers can be sure employees are reminded of their objectives to help facilitate the process. Never miss a deadline again. oneHR ensures that all managers keep up to date with important tasks that may be forgotten or paperwork which could ordinarily be mislaid. If an employee requests a holiday, relevant managers are instantly notified and asked to approve or reject their request. The email task management feature will ensure that any outstanding tasks are completed and you can keep track of changes to the system. This prevents subconscious errors such as forgetfulness and will assist employees with their time management in completing tasks to deadlines; assisting productivity & efficiency. 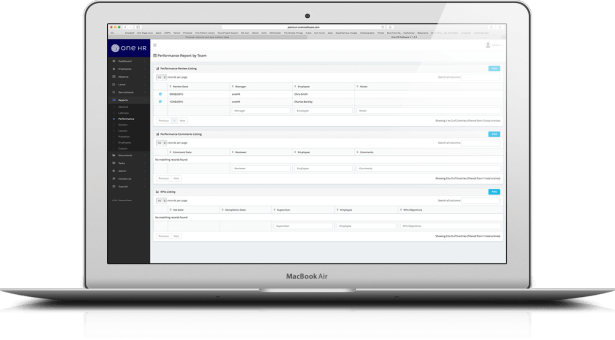 Having all your employee information in one view can help managers access real-time data quickly and efficiently. Managers can view team records which is perfect if you’re working out of the office or in the middle of a meeting and need to know who is available for a project, it is accessible 24 hours a day, 7 days a week. The secure online database includes all required employee information and records, users can then see records they are assigned access to. It is a legal requirement for a new employee to have the correct documentation and is obtained by the employer as part of their induction process, for example you need their references, eligibility to work within UK, relevant qualifications and a signed contract of employment. Companies that fail to produce and log these documents can be heavily fined - oneHR assists you in completing their induction properly. As a manager, you will also know employee contact details are up to date and on the system when required. They are logged simply and accessible when required. For those businesses who require more than just HR software, oneHR has a team of expert Employment Law professionals who are on-hand to provide oneHR clients with advice and support. oneHR Expert is an added service available to clients who need the additional Employment Law support, and can give legal advice at the end of the phone. Our experienced Employment Law experts are from our partners High Performance Consultancy who know that keeping up to date with changes in Employment Law is essential to managing your HR. Our Employment Law professionals make sure we update our clients with the complex issues relating to Employment Law; so if clients require external Employment Law support they can keep you up to date and compliant with the law. Protecting you and your people. "Seneca banking consultancy supports businesses which have been directly impacted by mis-sold Interest Rate Swaps and other Interest Rate Hedging Products." "Red Cow Media are a multi-award winning digital marketing agency based in the heart Manchester. The focus of the company is on high quality, bespoke search marketing with services ranging from SEO (Search Engine Optimisation) to PPC, Social Media management and paid social media advertising." "The main focus of Liverpool BID Company is to support and improve the business trading environment by investing monies, raised from a levy and sponsorship, into a programme of events, environmental and safety projects, as well as the marketing of the city centre as a world class visitor destination and business location. Liverpool BID Company was formed in 2005 as one of the first in the UK and is a member of British BIDs. "